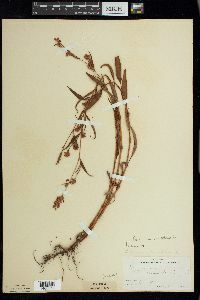 Plants annual, 1-20 dm; roots also occasionally arising from basal nodes; rhizomes and stolons absent. Stems ascending to erect, simple or branched, ribbed, glabrous or appressed-pubescent distally, eglandular or stipitate-glandular distally. 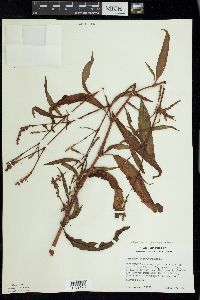 Leaves: ocrea brownish, cylindric, 5-20 mm, chartaceous, base inflated, margins truncate, eciliate or ciliate with bristles to 0.5 mm, surface glabrous or appressed-pubescent, eglandular; petiole 0.1-2(-3) cm, glabrous or appressed-pubescent; blade sometimes with dark triangular or lunate blotch adaxially, narrowly to broadly lanceolate, 4-17(-23) × (0.5-)1-4.8 cm, base tapered to cuneate, margins antrorsely scabrous, apex acuminate, faces glabrous or appressed-pubescent, eglandular or glandular-punctate abaxially and occasionally adaxially. Inflorescences terminal and axillary, erect or rarely nodding, uninterrupted, 5-50 × 5-15 mm; peduncle 10-55(-70) mm, glabrous or pubescent, usually stipitate-glandular; ocreolae overlapping, margins eciliate or ciliate with bristles to 0.5 mm. Pedicels ascending, 1.5-4.5 mm. Flowers 2-14 per ocreate fascicle, homostylous; perianth greenish white to roseate, glabrous, not glandular-punctate, accrescent; tepals 5, connate ca. 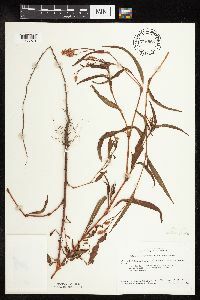 1/ 1/ 3 their length, obovate to elliptic, 2.5-5 mm, veins prominent, not anchor-shaped, margins entire, apex obtuse to rounded; stamens 6-8, included; anthers yellow, pink, or red, elliptic; styles 2(-3), connate at bases. Achenes included or apex exserted, brown to black, discoid or, rarely, 3-gonous, without central hump on 1 side, 2.1-3.4 × 1.8-3 mm, shiny, smooth. 2n = 88. 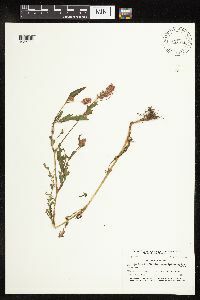 Flowering May-Dec. Moist, disturbed places, ditches, riverbanks, cultivated fields, shorelines of ponds and reservoirs; 0-1800 m; N.B., Nfld. and Labr. (Nfld. ), N.S., Ont., Que. ; Ala., Alaska, Ariz., Ark., Calif., Colo., Conn., Del., D.C., Fla., Ga., Ill., Ind., Iowa, Kans., Ky., La., Maine, Md., Mass., Mich., Minn., Miss., Mo., Mont., Nebr., Nev., N.H., N.J., N.Mex., N.Y., N.C., N.Dak., Ohio, Okla., Pa., R.I., S.C., S.Dak., Tenn., Tex., Utah, Vt., Va., W.Va., Wis., Wyo. ; South America (Ecuador); Europe (England, Spain). 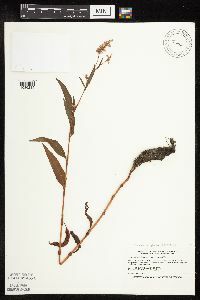 Persicaria pensylvanica is a morphologically variable allotetraploid, with P. lapathifolia probably one of the parents (L. L. Consaul et al. 1991). 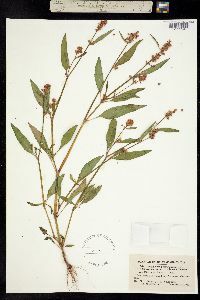 Three or four varieties (under Polygonum) often have been accepted in North American floras; the characters on which these are based vary greatly within and among populations. 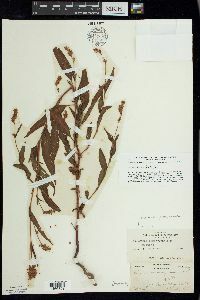 J. W. Taylor-Lehman (1987) concluded that Polygonum pensylvanicum is best treated as a polymorphic species without infraspecific taxa, based on specimens primarily from Ohio. 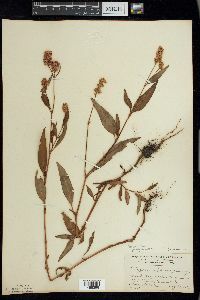 The heterostylous Persicaria bicornis often is included in P. pensylvanica. A single chromosome count of 2n = 22 reported by Á. Löve and D. Löve (1982), which could not be confirmed by Consaul et al. because the voucher could not be found, is excluded. Flowers with three styles and trigonous achenes are produced; they are exceedingly rare and probably mostly overlooked. 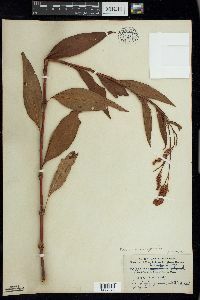 Several Native American tribes prepared infusions and decoctions from P. pensylvanica, which they used as drugs for humans and horses (D. E. Moerman 1998). Infrequent to frequent or common in low ground along streams and roadsides, in cultivated grounds, and in low grounds in general. No doubt it is found throughout the state. 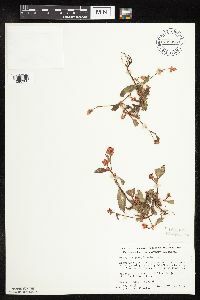 It has been my method to collect a single specimen of each species from each county. This species has been divided only recently and most of my collecting was done before the division was made. Since my specimens are now distributed among the three present groups, the absence of records from the northern part of the state is, I think, accidental. This species, as well as others of the genus, varies greatly in size, depending upon habitat and date of germination of the seed. Apparently the seed do not germinate under water and when they find lodgment in areas which are submerged until summer, the delayed germination, no doubt, accounts for the smaller plants. The largest one of which I have record is my specimen no. 39887 from low ground in Gibson County which I measured in the field. The height was 86 inches above the ground and the longest branch was 82 inches long. 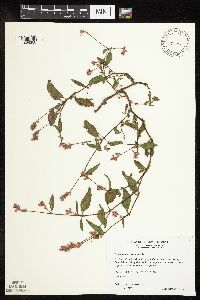 [Deam notes that a glabrous-leaved form is] frequent throughout the state in habitats similar to those of the species.